In nature an ecosystem comprises the complex set of relationships and interactions among the resources, habitats, and residents of an area for the purpose of living. This applies to people as well as other organisms. The ability of people to learn underlies the success of our species and learning is the core purpose of the ecologies we create to achieve the things we value. 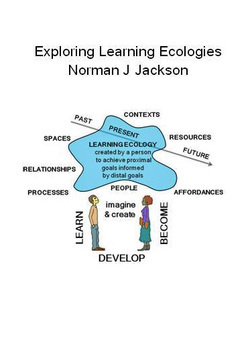 The idea of learning ecologies developed through this book, provides a more comprehensive and holistic view of learning and personal development than is normally considered in higher education. A learning ecology provides us with affordances, information, knowledge and other resources for learning, developing and achieving something we value. It includes the spaces we create to think and our processes, activities and practices for acting. It includes our relationships, networks, tools and technologies we use and enables us to connect and integrate our past and current experiences and learning and provides the foundation for our future learning. The concept is relevant to the Social Age and the book will be of value to teachers and other education professionals who are helping learners prepare for the complexities, uncertainties and disruptions of their future lives. The aim of this book is to make better sense of a long, complex, messy, change process through the stories of those who were involved. Over fifty participants were interviewed during the course of the study and their uniquely personal perspectives have been woven into a compelling story of organisational change. This book describes their ingenuity and effort in bringing about change that they and their organisation valued. Between 2009 and 2012, Southampton Solent University (UK) engaged in an unprecedented and highly complex strategic initiative which ran across the entire institution, its structures, processes and systems; it aimed to produce a fundamental shift in institutional culture. Such an all-embracing approach is rare in universities. This programme of organisational change is seen through the eyes of people who were immersed in the process. Their perspectives and feelings will resonate with anyone who has tried to bring about significant change in a university. Universities are inherently creative places but too often there is a pervasive inertia that prevents ideas from being turned into new and better practices. This programme aimed to create a culture of innovation. Conventional project planning techniques were deliberately avoided and replaced with an approach based on complexity theory, recognising that the process of change requires constant adaptation, acceptance of non-linear progress and subversion of conventional management discourse. Offering an unusual example from the higher education sector, this study is a distinctive contribution to the extensive literature on organisational change. Learning gained from participants is related to theories and research from this wider literature. The study proposes a holistic and integrated approach to change which might offer a more culturally relevant and sustainable model both for higher education and for those sectors of industry and commerce from which much change management practice has conventionally been drawn. ​This book is the proceedings of a conference held in 2014. It recognises and celebrates the many different ways in which universities and colleges are encouraging, supporting and recognising learning, personal development and achievement gained outside as well as inside the academic curriculum. The book contains thirteen descriptive accounts of institutional schemes and other approaches to support and recognise learners' lifewide learning and personal development, together with a small number of research and evaluation studies aimed at understanding how students are learning and developing through their lifewide experiences. How we prepare students for the challenges that lie ahead of them as they grapple with a world that is becoming ever more complex, challenging, disruptive and uncertain, is the problem that unites all who are involved in education. This book argues that we can do more to help learners prepare themselves for the challenges that lie ahead by embracing a lifewide concept of learning and personal development. If lifelong learning occurs at different times in a person's life, lifewide learning occurs in different spaces and places simultaneously. Students' higher education experience may span three or more years in their lifelong learning journey but during that time they will inhabit many different spaces on and off the campus. In these different spaces they develop relationships, encounter different sorts of challenges, seize or miss opportunities, aspire to live a useful, productive and fulfilled life and seek to achieve their ambitions. By adopting a lifewide approach to education a university can help students be more aware of the significant learning and development they are gaining through such experiences and help them make their education more complete and relevant to their future life. The book provides a rationale, underpinning philosophy, research base and practical examples of learning partnerships that enable lifewide learning to be recognised and valued by a university or college. It will appeal to anyone who is interested and involved in helping students maximise the learning and development they gain from their higher education experience. While the ideas and practices have been developed in a higher education setting they can be readily adapted to other educational contexts. Our ability to imagine and then invent new worlds for ourselves is one of our greatest assests and the origin of all human achievement, yet the importance of creativity in learning and achievement is largely unrecognised in a higher education world that places more value on critical and rational thinking. It is a vision of a higher-education world in which students’ creativity is valued alongside more traditional forms of academic achievement that provides the driving force for this book. • and offers practical advice on how to foster creativity at an individual and an institutional level. Developing Creativity in Higher Education will appeal to teachers, educational developers and institutional managers who want to enrich the higher-education experiences of their students and enable them to develop more of their potential. As we enter the 21st century, new organizational agents acting as brokers are emerging as important facilitators of systemic change. The central argument in this book is that brokering is a process that facilitates change at all levels of the education system and enables UK higher education to be more adaptive and responsive to society and the global marketplace. The educational broker is a facilitator who connects people, networks, organizations and resources to support change. The process is key to creating new innovative capacities involving partnerships that are now required of a socially attuned and continuously adaptive mass system. The educational brokerage role also includes activities that might be associated with the business world - where the broker is an agent, promoter, dealer or trader, or the political world - where the broker is a diplomat, mediator and negotiator. There has been little recognition, description or analysis of brokerage which is essential to the rapid development and utilization of knowledge in a large, complex, diverse, multipurpose and autonomous HE system. These new capacities offer exciting possibilities for advancing UK HE and for gaining competitive advantage. This volume provides, through a series of organizational case studies, important new insights into the ways in which change is being brokered by national bodies like the Learning and Teaching Support Network, University for Industry, the e-university and the Quality Assurance Agency. It also provides an overview of the international scene to show that UK higher education is leading the world in this approach to the development of a higher education system. Benchmarking is a popular tool for self-evaluation and self-improvement in industry and commerce. It enables an organization to compare itself with others, to identify its relative strengths and weaknesses, and to improve its working practices accordingly. In higher education it is now being promoted to support the regulation of academic standards and also as a vehicle for improving educational, administrative and business processes in a globally competitive academic environment. This work provides an holistic view of the application of benchmarking. It uses case studies and system-wide reviews to show how benchmarking is being used by universities and colleges, by subject and functional communities, in the UK and in other higher education systems, to aid self-regulation and self-improvement. It is relevant to academic and non-academic managers in higher education.